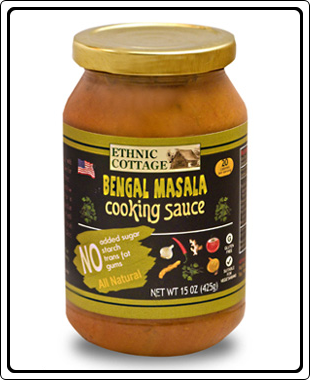 Ethnic Cottage’s Bengal Masala Cooking Sauce with Aromatic Fenugreek leaves makes a mild, creamy base for an authentic Indian meal. GMO and Preservative free. Ingredients : Tomato Puree (Tomato paste, water), Diced Tomatoes, Onions, Fresh Light Cream*, Lemon Juice from Concentrate, Expeller Pressed Canola Oil, Fresh Ginger, Fresh Garlic, Coriander seeds, Cumin seeds, Sea salt, Paprika, Turmeric, Fenugreek leaves, Red pepper, Cinnamon, and Cloves. Cooking Directions : Place 2.5 - 3 pounds of boneless (or 4 - 5 lbs on-the-bone) chicken in a skillet. Pour in contents of jar and 8 oz of water. Cooking over medium heat with occasional stirring for 15-20 minutes or until the chicken is thoroughly cooked. Garnish with fresh chopped cilantro and serve over warm Basmati Rice, pasta or Pita Bread. Serves 10 - 12.